It's "Jane Pattison 1806" by Shakespeare's Peddler. I have decided to use the cottons instead of the wools on 40 ct. linen. I think I'm going to go with Lakeside Linens Lentil. Das Stickbild ist sehr schön geworden. Das neue wird auch sehr schön. Bin schon gespannt. Very pretty, Nicole. The colors look great on your linen. Oh my gosh, Nicole, this piece is stunning! It's going to be fabulous, framed. Yay for being almost there on finishing up the castle. It's a gorgeous sampler. I'm looking forward to seeing your Jane P. stitched up in the cottons. It will be fun to see the difference between the cottons and the wools. Nicole, your Elizabeth is lovely ... what an accomplishment! I love the colors on Jane. Looking forward to following your progress. Wow! So beautiful. I have this one to do in my stash. It's always so hard to decide what to pick next especially after seeing your work. I love your fabric. It makes your work stand out beautifully! Wow, well done on finishing the huge building - it's gorgeous! Your new one (and the flosses) looks to be another "winner" too. Wow..you accomplished alot on Elizabeth Mears. Although the castle looks very tedious to work on, it is absolutely beautiful!! Can't wait to see it finished!!! I love your new pattern too!! Your castle is so beautiful! I love that Jane Pattison pattern too, I haven't decided yet to go with cotton or wool though. Looking forward to seeing your start in the cottons. Holy cow, Nicole! You really stitched that castle quickly! I am working on houses and they seem to take FOREVER! I absolutely love your sampler! 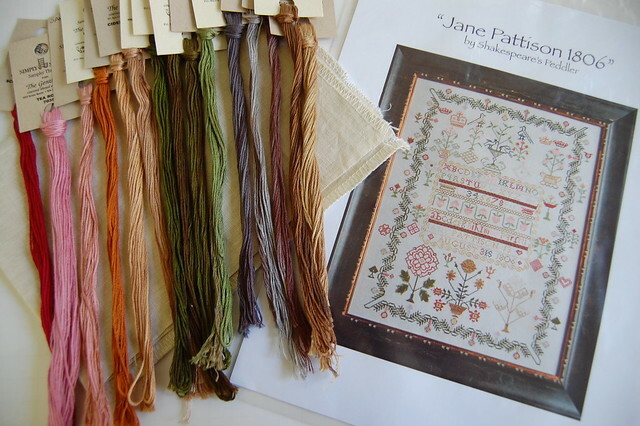 The Jane P. sampler is so pretty and I can't wait to see your progress on that one. The castle is huge! The rest of the sampler should be a breeze! Beautiful work Nicole and I love your new stash!! I have been looking at that one too!! May have to have it too and I like you would rather use something different than the wool threads. Elizabeth looks wonderful and that castle is really something. This is going to be a stunning finish. Elizabeth is beautiful! Looking forward to seeing your start on Jane P.
The castle looks amazing...and is huge! I can't wait to see your start on Jane. I love her and think I will stitch on 40count with cotton as well. I'm not ready to start yet though. Very pretty, I know you're glad to be done with that house!!!! And I love Jane, I am using the cottons too with Beige linen. That castle is spectacular! Love the new project. Now that some stitching... congrats on almost getting that part done! WOW Elizabeth is really looking fantastic. The castle on its own is truly stunning. Your new project looks just as good as your other ones. Your Elizabeth Mears is wonderful! Just gorgeous! Love the cottons for Jane too! Congrats on finishing the castle, Nicole! That's huge! Looking forward to seeing your progress on Jane. Wow! Amazing piece and love the new project as well! Oh wow, that is quite the impressive castle. Gorgeous stitching, Nicole. Your new pattern is beautiful. All those yummy floss. Jane looks great and I love your new project! How many ways to say, Elizabeth is beautiful? You've made wonderful progress! I've looked at Jane so many times, but must hold off until some others are done... so that makes me all the happier that you're stitching her. Love watching your beautiful works come to life! Happy stitching and enjoy the summer days! Congrats on almost finishing!! It's such a stunning sampler! Oooh, can't wait for your Jane to start! I love that new sampler!! Your Elizabeth Mears sampler looks wonderful! After having stitched that enormous building, you must feel you are now in the "home stretch". I hope you'll send me a photo to put in my next newsletter. I like your new stash too. My goodness but this is a lovely piece! There's quite a lot of stitching in that castle for sure. Love your choice for your new start too. Perfectly stitched~~ Love this large design...And, your new stash as well!! Beautiful, Nicole. I love it !! Wow! 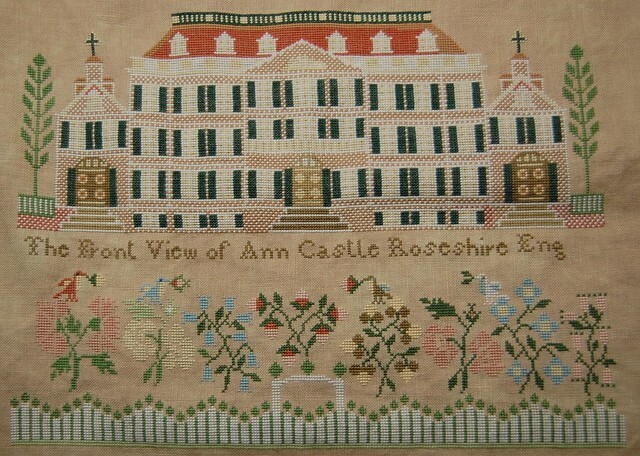 That was a lot of stitching on the castle! It looks stunning though. What a nice choice in Jane, she is such a lovely sampler. Don't you feel like you can do anything now? Please send me a photo of your completed sampler too. I would love to share it on my website.